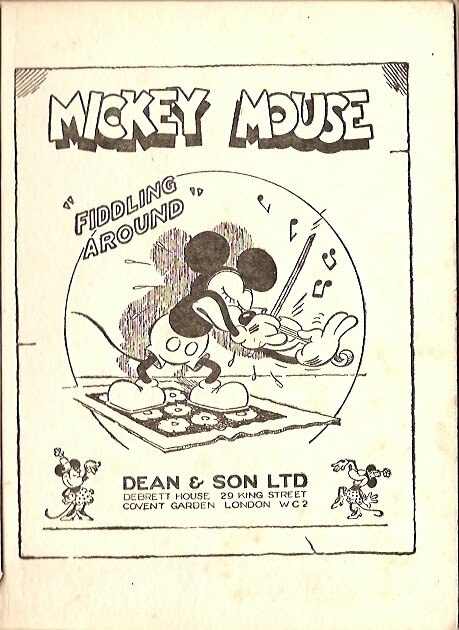 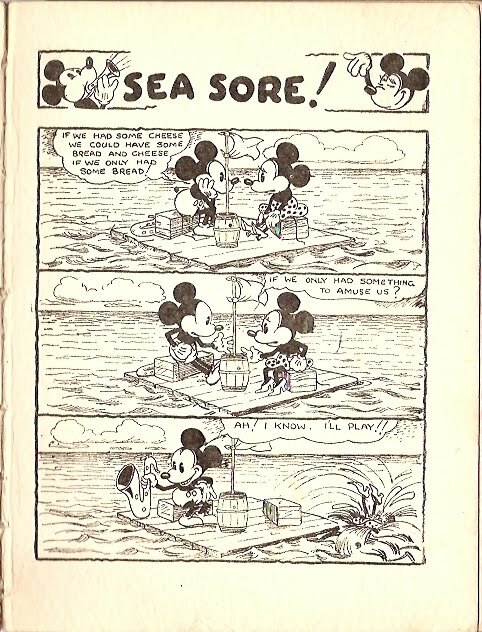 The first Mickey Mouse Annual, published by London's Dean & Son Ltd, is of great significance in the history of Disney publications. 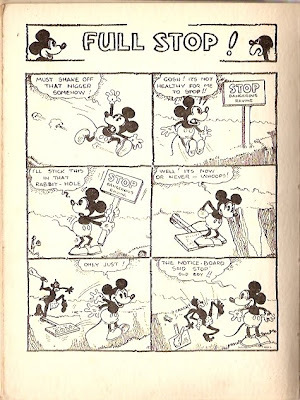 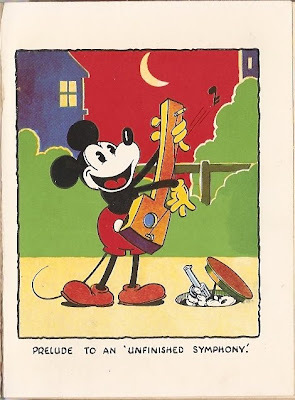 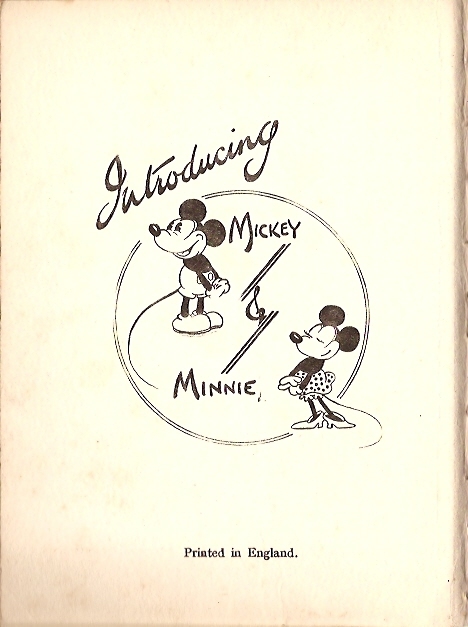 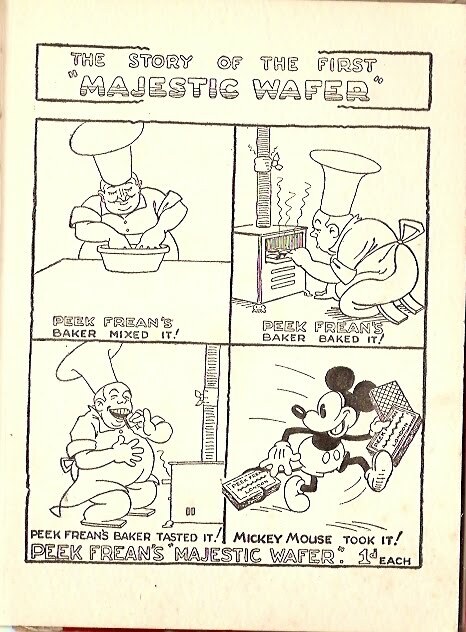 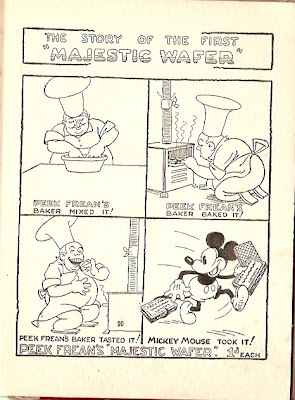 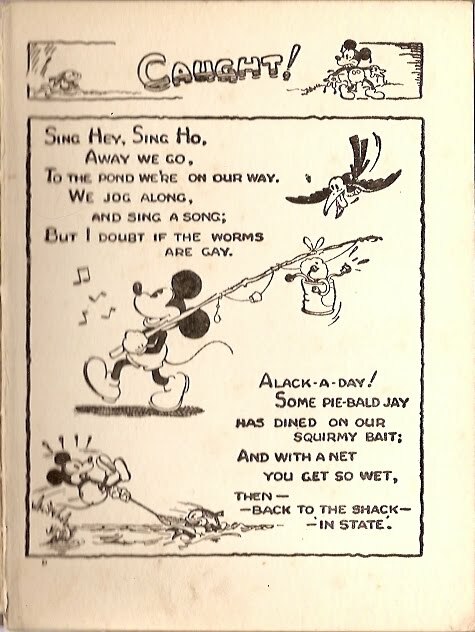 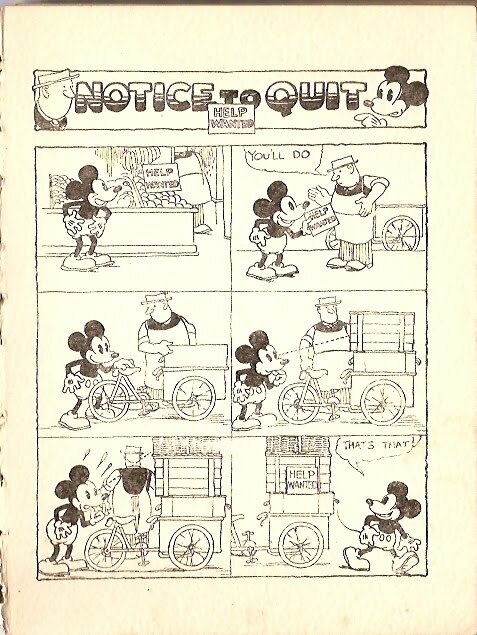 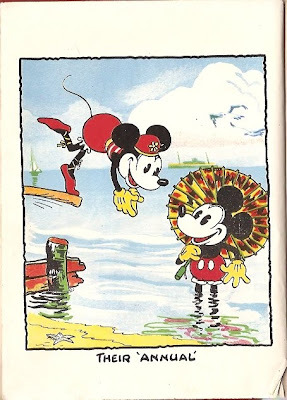 Published possibly around Christmas of 1930, it is the first-ever Disney book published for retail, a Mickey Mouse Book which had come earlier in the same year in the US having been printed as a give-away for promotion purposes. 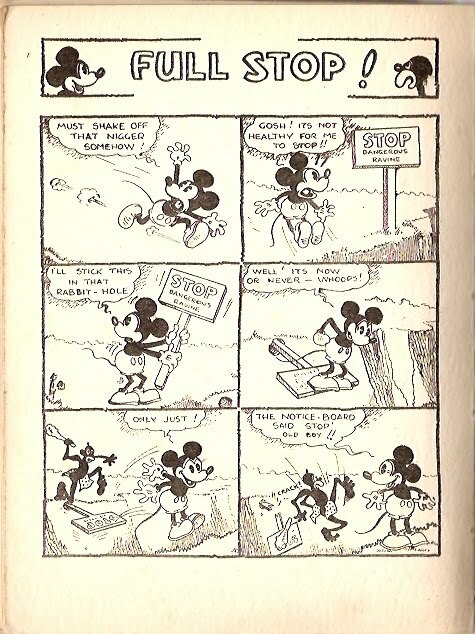 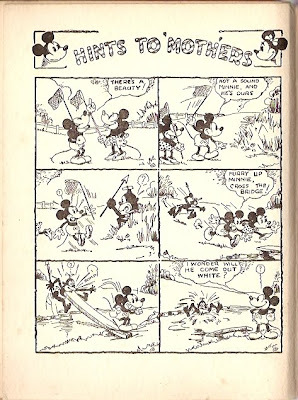 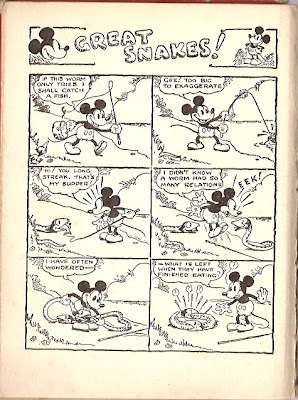 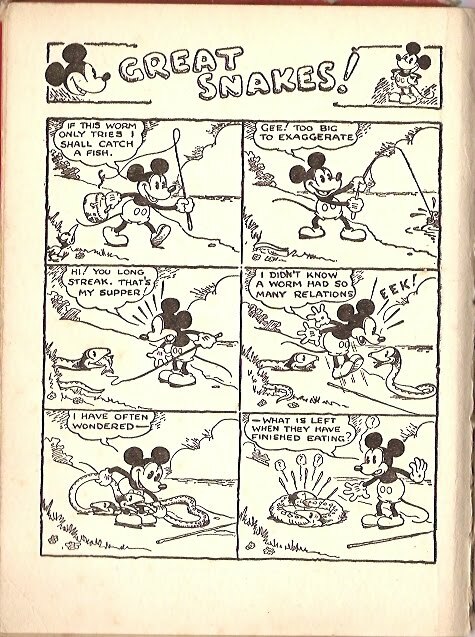 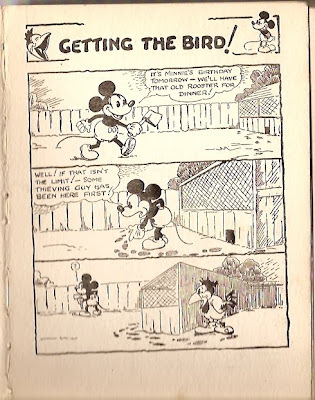 Furthermore, this MMA marks the first-ever appearance of Disney comics produced for publication other than newspaper syndication. 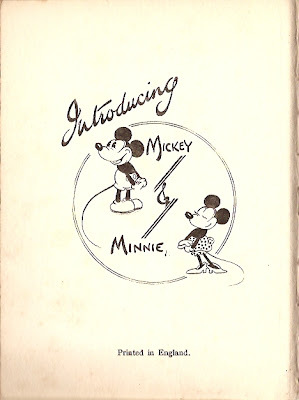 Oddly, there is no reference whatsoever to any affliation to the Disney company in either this title page or anywhere else in the annual that I could spot (most subsequent British Disney publications would include a tagline about "permission from the Walt Disney Mickey Mouse Ltd."). 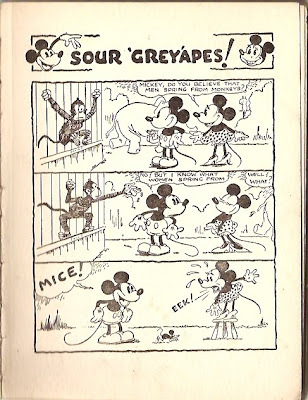 Below is the scan of the first gag page (acc. 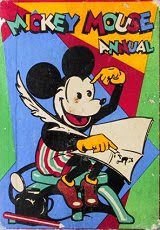 to David Gerstein's index at inducks, it is "partly made up of US clip art"). 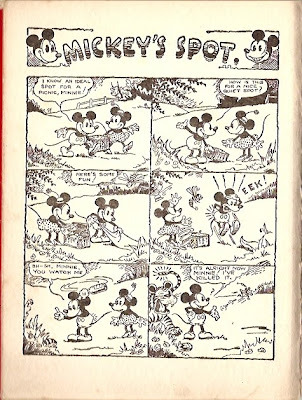 This is in a format close the comics format in the sense it includes more than one 'panel', but, in my opinion, would qualify only as a 'pseudo-comics' because while the the panels are sequential in a sense, they are not in the same diegesis (ie. 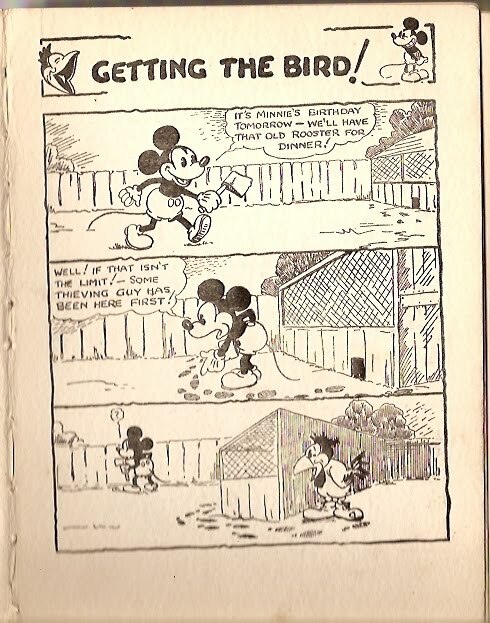 the event depicted in the second panel is not of the same plane of reality as of the first panel). I find the above gag noteworthy for two reasons. 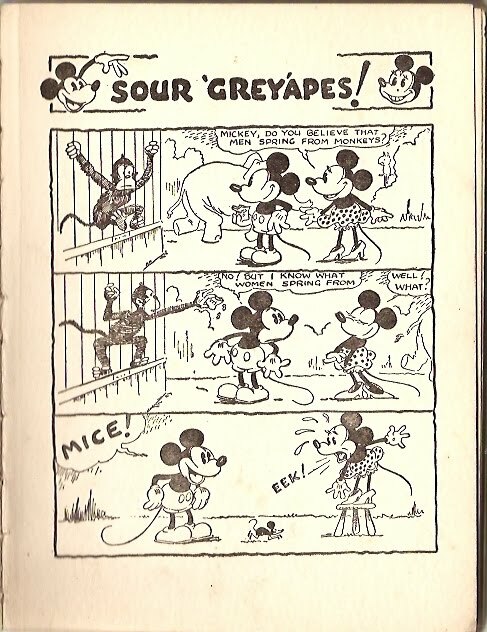 First, the side-line inclusion of a secondary humour element in the monkey silently stealing Mickey's food in the second panel is remarkable. 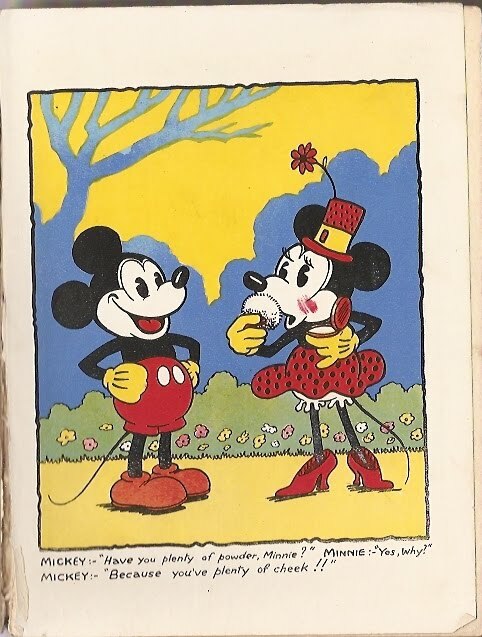 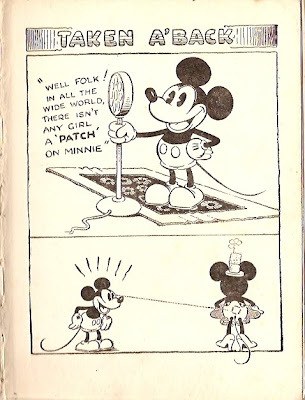 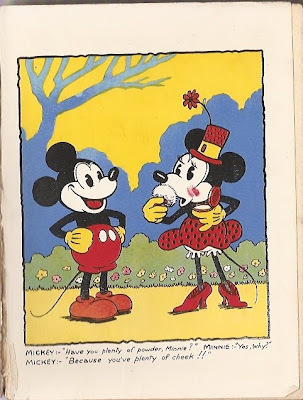 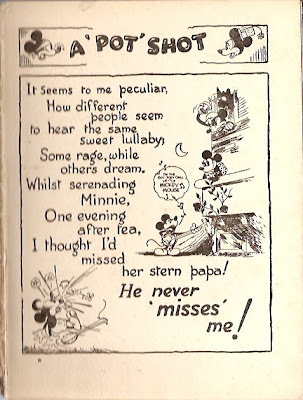 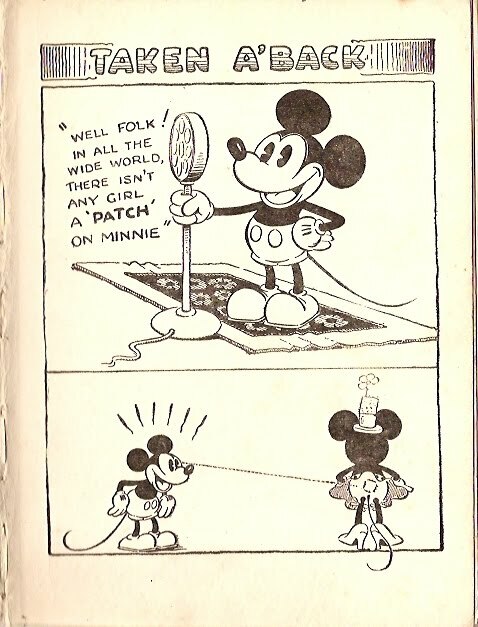 Furthermore, producing a gag about women's fear of mice personified in Minnie's such fear is, on one had, ironic since she is, after all, an andromorphized mouse, and, on the other had, significant in showing the degree of internalizing the andromorph nature of Minnie (and Mickey). 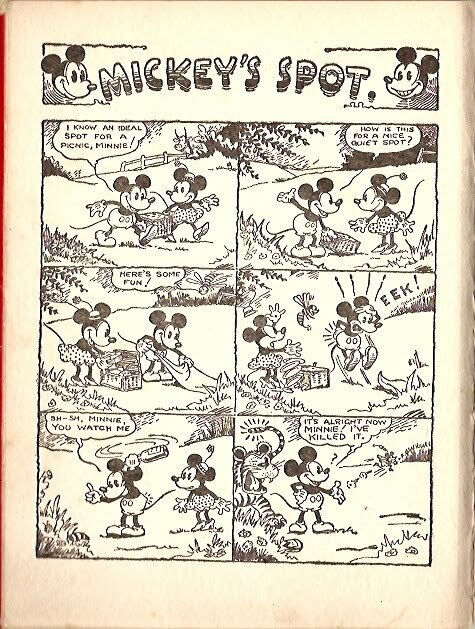 Thank you for this interesting reading. 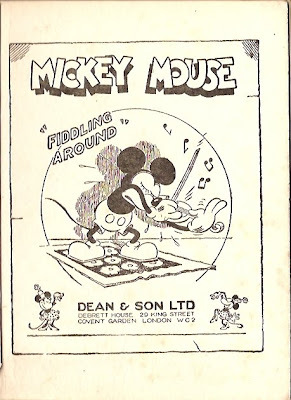 BTW, I have copied those scans on Inducks for archiving, I hope that's OK for you. 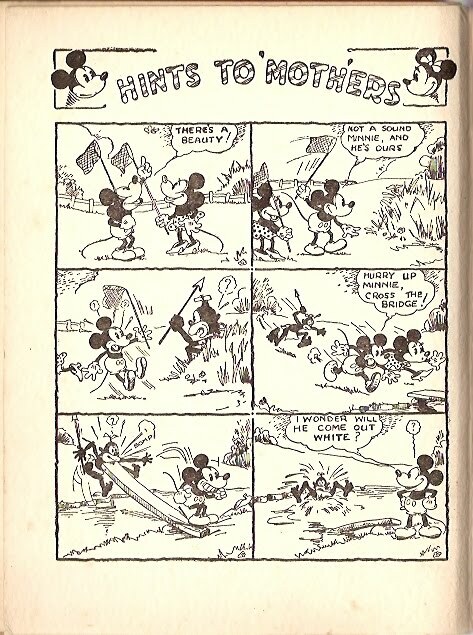 Without meaning to steal your thunder, let me point out that Tomart's Disneyana Update is presently running a three-part series I wrote on the Annual for my friend Didier Ghez. 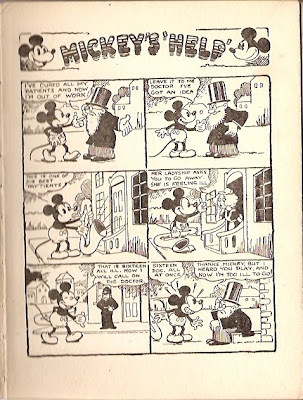 In researching it, I corresponded with surviving relatives of Haughton and hope to have presented some new information—for example, that Haughton was definitely with the Annual from the start (though he split up the first with a cruder second artist, as you note); and that before drawing the Annual, he'd earlier drawn Mickey for a German toy firm—drawing the infamous toothy Mickeys seen on the Hurdy-Gurdy and other famous early tin toys. 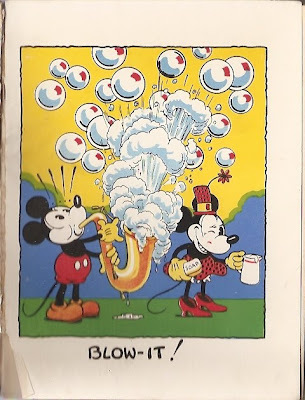 François: thanks for copying the scans to inducks, I would do that myself sometime, but had forgotten. 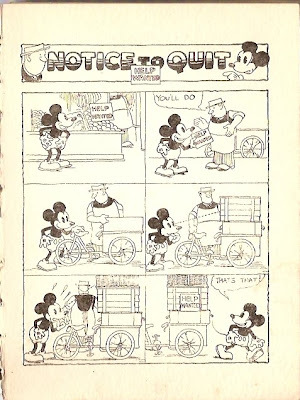 David: thanks for the additional info on WHa, I'll revise my wording at the post accordingly.